Kelly M. O’Brien and Angel Greenham, The Cells Residency installation view. ©2018. 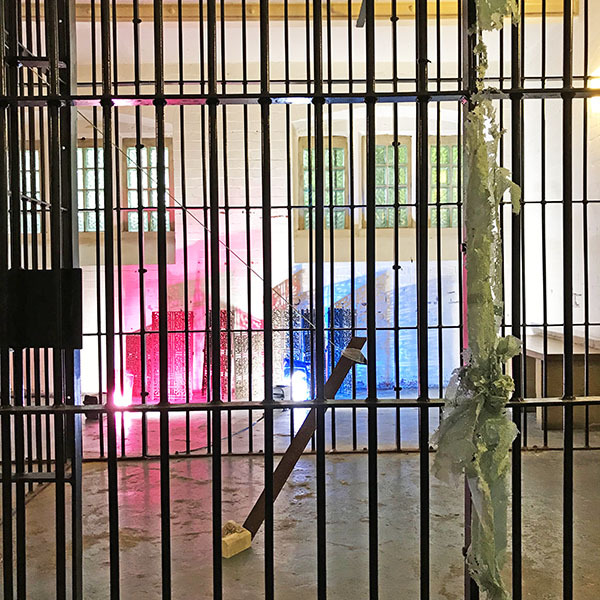 This month I have been collaborating with artist Angel Greenham at Trowbridge Arts Centre as part of her summer residency in The Cells. We spent last week immersed in this fascinating space, creating unexpected interventions with found objects, juxtaposed materials, motion, and light. It’s been a brilliant experience, thanks to Angel’s generosity and openness to welcoming me into her workspace. During our brief collaboration, I learned a ton about experimenting with site-specific work, a first for me. We opened briefly to the public this past Saturday, welcoming our visitors with Angel's housemade pavlova's and tea in proper china cups – a little magic to encourage voluntary lingering and conversation in a space where occupants have otherwise passed time involuntarily in bygone eras. Angel Greenham’s homemade pavlova’s and tea service at The Cells Residency, a pop-up collaboration as part of Angel’s longer summer ‘sentence’ at Trowbridge Arts Centre. Invitational Pop-up Installation in collaboration with Angel Greenham, The Cells Residency, Trowbridge Arts Center, Trowbridge, BA14 8EQ, 10 September - 4 October. Open to the public on 23 and 29 September, 11 am - 2 pm and 4 October 6 - 9 pm.